A Ketubah to Match Your Wedding! We recently had the pleasure of working with a couple who was looking to display their Ketubah at their wedding reception, and wanted to work with our artists to create the perfect work of art to compliment the style and color theme. We were excited to face this challenge, but it also made us realize: this Ketubah will be about far more than matching the reception, but matching the couple themselves! An awesome modern ketubah is more than skin deep. Finding the color scheme for your wedding can be confusing and a maybe even a little frustrating—where do you start? How do you know what is too dark and what is too light? Will the tablecloth match the centerpieces match the carpet? Will a color come off as too harsh or cheesy? How can I look modern without giving the cold shoulder to tradition? Every now and then we find a great resources for wedding planning that goes above and beyond the typical “Check out our vendor list!” (though we love them too!). For that, we thank wedding planner extraordinaire Preston Bailey for his incredible What’s Your Color Story wedding palate picker. This tool is everything we are all about: rich color, tasteful design, and personal meaning. With an uber-easy to use design layout, the This Is Not a Ketubah team has fallen in love with this awesome tool, and we’re excited to share it with our couples here with our other design musings. As a modern art collective ourselves, we know the importance of well planned and well executed colorful works of art. 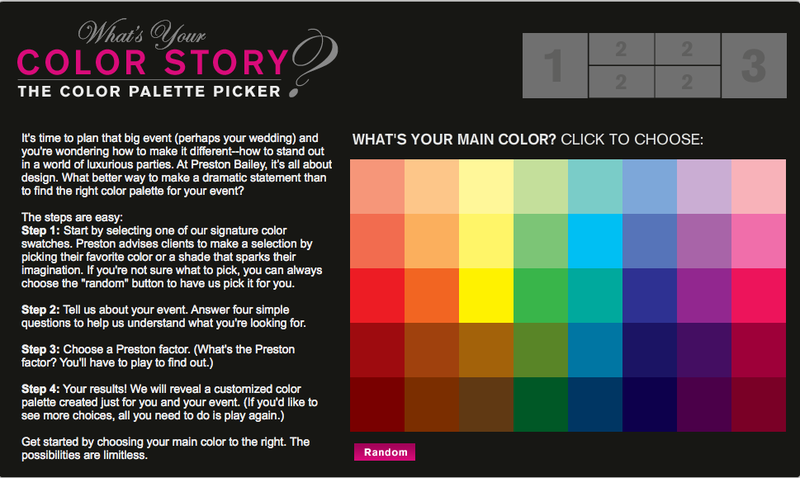 By calling on modern masters to create some awesome fun designs for all types of couples, we think sharing Preston’s color palate selector is great for any wedding type—Jewish or otherwise! We’d love to work with you a personalized custom Ketubah that matches your wedding in every way possible: color theme, and your own passions and interests. In the mean time, have a meaningful Yom Kippur!